Arpi is out and about in a poncho this time. She notched up the style with a black floppy hat. She matched the hat, belt, and bootie to pull the look together. She brightened up the earthy and dark colored ensemble with a deep orange ribbed turtle neck pullover sweater. Ponchos are known to be in use by the Native Americans and other Andes and Pre-Inca cultures since pre-Hispanic times. Therefore, it has typically been associated with traditional garments of the Americas. Ponchos were interesting because they were unisex and worn across age groups. Poncho concept have since then trickled into world fashion and been adopted by Westerners and other cultures around the globe. Tips: Pair a poncho with body hugging bottoms to accentuate the shape of the poncho and add length to your legs. 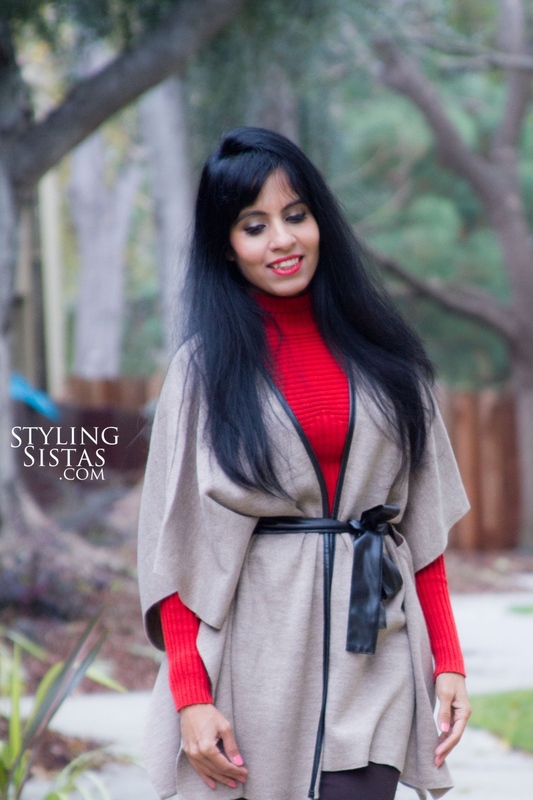 Cinching at the waist with a belt makes a poncho look attractive even over flared skirts. Thankfulness to my father who told me regarding this weblog, this website is really awesome.